Contributing sensory euphoria to the healthy snacking arena with a range of savoury snacks. 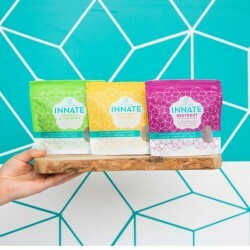 Innate was created by Elsa and Tess, who believe that food is a combination of art, science and maths. 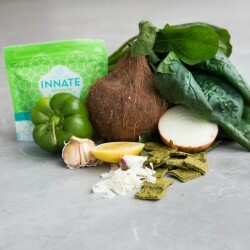 They aim to create genuinely healthy, delicious and interesting food whilst educating people on the benefits of feeding your body with good stuff! 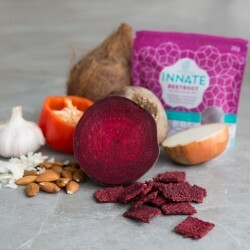 Their range of colourful savoury snacks are not only good for you but taste good too. They have chosen ingredients that combine exquisite flavour with a high calibre of nutritional balance and slow release energy. 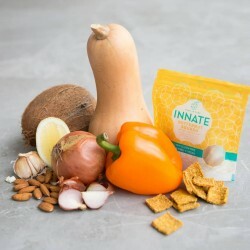 Everything is 100% Natural, Vegan, Paleo, and free from Gluten and Refined-sugar.